Slipping in at the last minute with a card for the current CASE Study Challenge. Having a bit of trouble getting back in the saddle after a busy couple week's, but I really wanted to play along with this fantastic card by Jennifer McGuire. ACK! Big, big fab on this! I love your CAS style! 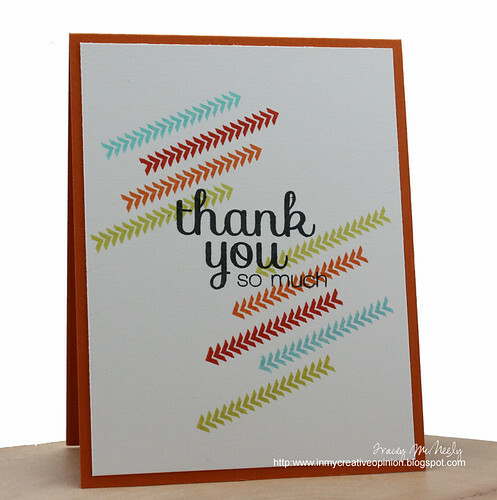 Love the bright colors ~ fantastic take on this card! Wonderful case. 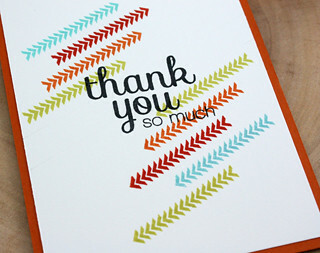 I love how you mimicked the colorful washi chevrons with stamped chevrons. And, the colors are so fun, too. I love the free floating arrows...awesome take on Jennifer's card. CLEVER! love how you reduced the layers! Just perfect for the challenge. Love the colors ! LOVE your take on this challenge. Love the way you always think outside the box! 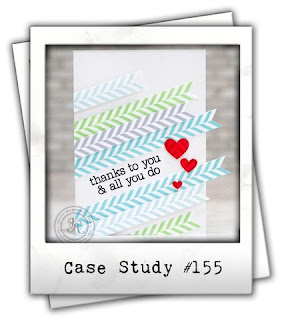 I love those stamped chevrons!! Oh, I love this! Perfect CASE! This is awesome, Tracey! I love the colours you used and those arrows are perfect! Brilliant CASE!